Translated from the Japanese bestseller, Master Modeler tells the story of how Shunsaku Tamiya turned a debt-ridden lumber business into the world’s leading manufacturer of model kits. During his childhood in wartime Japan, Tamiya was obsessed with American fighter planes. 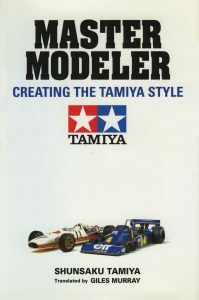 It was he who persuaded his father to diversify from selling building lumber into the manufacture of wooden models in the late 1950s; and it was his stubbornness and fanatical attention to detail that made Tamiya into the most highly regarded model manufacturer in the world. This frank autobiography covers all the highs and lows of Tamiya’s progress: the obsessive research behind the hit models; the commercial triumphs like the original Panther tank, military miniatures, F1 racers and MINI 4WD cars; inside stories on the development of revolutionary products like electric R/C motors; and the rare failures, like the early Battleship Musashi. This is the story of an inspired hobbyist who turned his private passion into a multi-million dollar business.